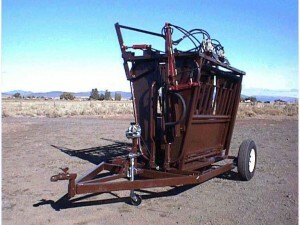 The finest hydraulic squeeze chute, manufactured by Salt Creek Chutes. Salt Creek hydraulic squeeze chutes and cattle working equipment are all made from the highest quality steel, and constructed to last a lifetime. 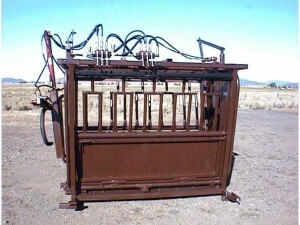 Salt Creek Industries designs and builds cattle working equipment and hydraulic squeeze chutes. All our products come with an unconditional guarantee for 12 months, no matter how many cattle are run through them. View our Complete Hydraulic Squeeze Chute Price List here. Standard hydraulic squeeze chutes are long enough to preg-check through the side, with no need to get behind cattle. Each hydraulic chute has five side gates and is equipped with a single phase 220 Baldor 3 HP electric motor. Also standard are one full length bottom door and one split bottom door, which is excellent for testing bulls. If you’re looking for something a little larger, our Magnum Hydraulic Chute is the answer. This chute opens three inches wider than our standard squeeze chute. In addition, it is a full nine-feet long. The econochute is equipped with a manually adjusted bottom. Standard loading chutes come 14-feet long with a left side catwalk. A walk-through door is also standard. Adjust your loading chute width the same as a crowd alley. This width will keep light cattle from turning around. Salt Creek’s newly designed portable chute doesn’t need batteries or motors. The portable jump chute is a very handy and economical addition if you already have or are going to purchase a Salt Creek hydraulic squeeze chute. 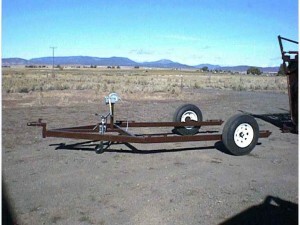 Our wishbone style trailer was designed so that one person can move the chute in the least amount of time and with the least hassle possible. Our most popular combination groups three products. Nothing beats the highly customizable hydraulic squeeze chute, simple to operate trailer and reliable gasoline powered hydraulic unit. This has proven to be our most popular product combination, especially with veterinarians and ranchers on the move. The mugger was designed to restrain the head movement of mouthing cattle, but has a variety of other uses, including doctoring eyes and checking or administering ear tags. The Mugger can be included with any of our squeeze chutes. 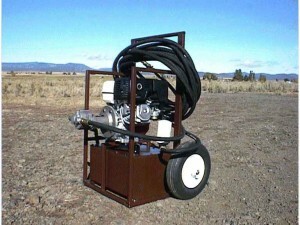 This Honda 11HP gasoline powered hydraulic unit makes for trouble free operation in remote locations. This is the preferred option of most veterinarians. Our new manual calf table is built to handle big calves and will last for generations. Not sure what you need? Email us with your questions or equipment requirements and we’ll help you with the equipment that’s right for you. Salt Creek Hydraulic Squeeze Chutes, the strongest factory built loading chute available today.